Now 17 feet tall, this retired rental tree was planted at a City Hall 16 years ago. Our seasonal decorations include everything from purchasing Poinsettias or Easter Lilies, or Earth Day tree seedlings, to rental of LIVE (not cut) Christmas trees. For the holidays, Plant Manning offers the most ecological choice for Christmas trees. 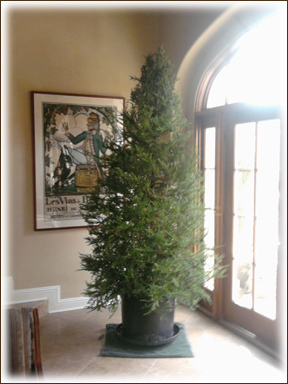 Plant Manning's Tree Concern will deliver a living (not cut) potted Redwood or Colorado Spruce Christmas tree to the customer's home or office. 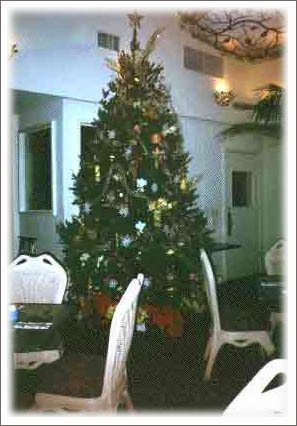 The service includes free delivery and post-holiday pickup of a guaranteed beautiful tree in a sturdy base pot. The tree is a living air freshener, reducing fire hazard. Customers can even lease the same tree year after year, making this service an attractive option to an otherwise wasteful holiday tradition. 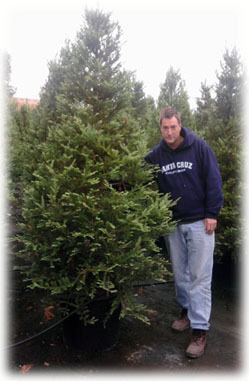 Over the past twenty years of renting the Living Christmas Trees, we have had over 500 tree deliveries. Please Call for pricing and availability of additional sizes. Can we rent the same tree, year after year? Yes. We put the name on the tree container, and people can have the same tree, year after year. What kind of environment does a live Christmas tree require? The trees prefer cool environments, no direct forced air heat or hot bulbs. We have the most perfect live trees you'll find anywhere; but after four or five years, even though we are very careful, they do become a little damaged. The trees we use don't spread disease or pests when planted in local California environments as many pines do. What size container does a living, potted Christmas tree require? Containers size is determined by the age and caliper (diameter at the base) of the tree. A heavy, older tree is usually the best for the classic Christmas Tree use. 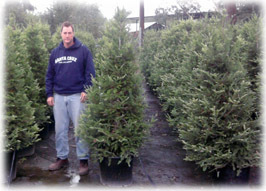 These trees usually take a 35-gallon container about 24" wide and 14" deep. A 7' tree will often weigh more than 400 lbs. Is it difficult to maintain a living Christmas tree? Not at all. We provide specific instruction about amount of water and watering intervals based on the environment in which the tree is placed. We assist in closing heating vents that are directly blowing on the tree and are able to see a 90% reuse rate. How much bigger will our tree be next year? Families are happy to see the same tree and share their memories every Christmas before it is planted. When the tree is slowly rolled through the doorway we almost always get asked if it is bigger. But seldom does the tree grow more than four inches in a year.